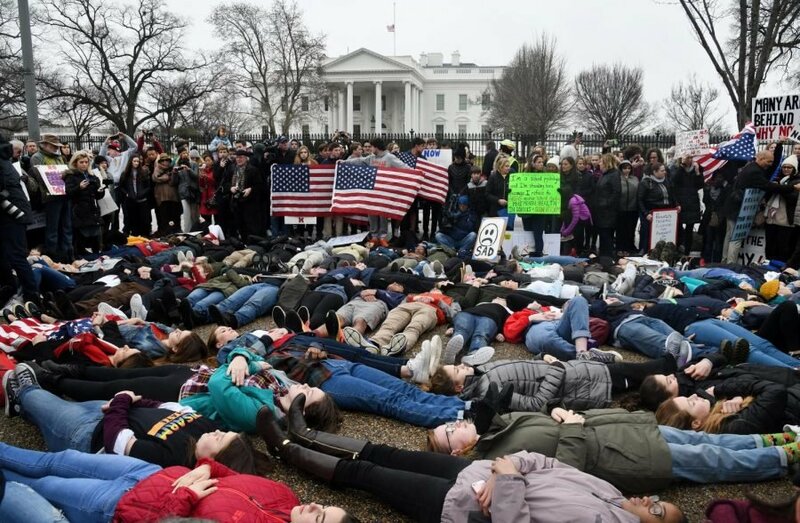 Students take part in a “lie-in” on the road in front of the White House last week after a Florida gunman killed 17 people the week before. Disciplinary action for participation in political demonstrations will not impact admission decisions, the University announced on Friday. Suspensions and other school-imposed disciplinary penalties for peaceful political action will not affect admission to Northwestern, the University admissions office announced in a Friday Facebook post. In response to questions about “school-imposed repercussions linked to walkouts, particularly those happening in response to gun violence,” the Office of Undergraduate Admission issued guidance to students awaiting decisions. “While we’ll continue to review all applicant and admitted-student disciplinary actions on a case-by-case basis, rest assured that a school-issued penalty for peaceful participation in such protests will not jeopardize your admission to Northwestern,” the post said. Students across the nation have organized for legislative action after a gunman killed 17 people at a school in Parkland, Florida. Students from Marjory Stoneman Douglas High School, where the Feb. 14 shooting took place, have advocated from the forefront of the movement for gun reform, speaking at meetings with Florida lawmakers and a CNN town hall. Parents and survivors have also met with Washington lawmakers. Student activists have staged walkouts, “die-ins” and other demonstrations across the country in the past week. A nationwide walkout is scheduled for March 14 and is already set to gain support from Northwestern students. Stoneman Douglas students will return to the classroom Wednesday for the first time since the shooting, according to a Broward County Public Schools news release, but other students in the country have organized by missing or disrupting class. According to the Supreme Court ruling Tinker vs Des Moines, federal law protects students’ political speech, as long as it does not infringe on others’ rights or “materially and substantially interfere” with the school’s operation. But some high school officials have threatened students with disciplinary action for engaging in political demonstrations, according to a CNN Feb. 21 article. Other peer schools, including Brown University and Boston University, have issued similar guidance. Schools had the option to report disciplinary history to the admissions office before the Jan. 1 application deadline, according to the Common Application, but new information of student misconduct can still impact admissions. Final admission decisions will be released beginning late March.